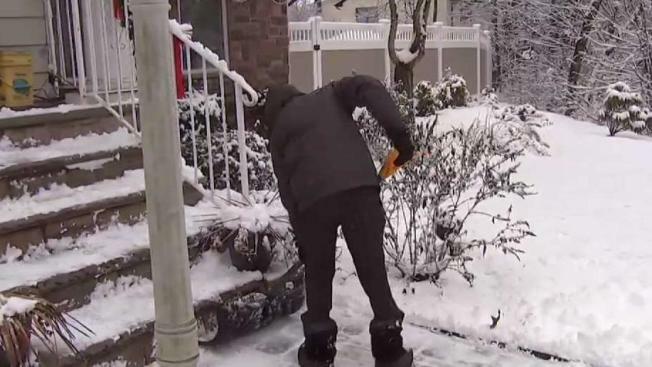 In New Jersey, this week's snowstorm left residents shoveling out before heading to work. Rana Novini reports. A wintry mix of rain and snow caused a troublesome commute for many tri-state residents Wednesday morning, contributing to nearly two dozen accidents, some involving multiple vehicles, in New York and New Jersey and causing some mass transit hiccups despite lack of accumulation in most spots. New York State Police reported at least four or five accidents involving two or three cars each on the Governor Mario M. Cuomo Bridge around 7 a.m., as early rains began to turn to a slushy snow mix, but no major injuries were reported. Police in one New Jersey town -- South Brunswick -- say they handled 14 crashes between 7 a.m. and 9:30 a.m., including one that caused a township sand truck to flip over. No one was seriously hurt in those cases either. The latest winter wallop was expected to leave some parts of the tri-state area with up to 7 inches of snow -- and Port Jervis and Mount Hope in New York's Orange County had already reported that much before 10 a.m., according to the National Weather Service. Other areas had about an inch by that time, and in New York City, there was no measurable accumulation by mid-morning. Nothing much had changed by noon, though Orange County's Otisville notched the most accumulation at 8 inches. Some spots in New Jersey saw about 3 inches, but that was the max. Connecticut's Fairfield County had less. Initial projections were higher for the city, prompting some winter weather advisories, but those were canceled ahead of the storm as newer models forecast rain to tamp down snow totals in those areas. Alternate-side parking was suspended in the city, though, to facilitate cleanup efforts. The wintry mix had tapered off in the city by early afternoon. By the Wednesday afternoon commute, Storm Team 4 says snow will have ended everywhere except for a possible lingering mix on Long Island. The storm comes days after temperatures plunged by more than 40 degrees between Saturday morning and Sunday, though this week remained above freezing, at least. That colder air is expected to stick around for most of the workweek, though temperatures will slowly creep up, inching up to the high 30s by Friday and launching into the high 40s on Saturday. Storm Team 4 says 50 degrees isn't out of the question for Sunday.